We both look forward to a confirmation of arrival from you at the earliest. Wishing you and Vidhyaa All the Very Best in life . May God bless the couple. Have a Happy Married life ahead. You were born together, and together you shall be for evermore…. I may not be there in Sivakasi but my blessings sure will be there. likewise u 2 r different but now onwards u will live one life !! 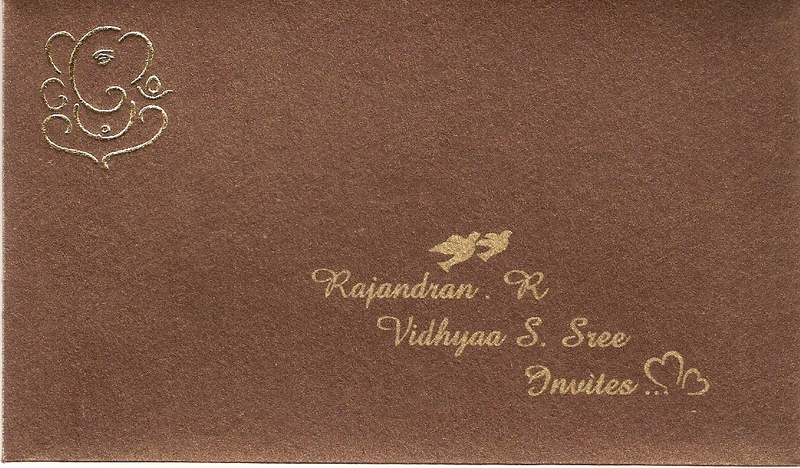 Wow, Congrats Rajandran and Vidhyaa, Do upload some pictures of the wedding party! My heartfelt congrats to both of you for a happy married life. May the Supreme Providence make you a loving, prosperous, healthy and cheerful couple. MUCH AS ME AND MY WIFE LOVE TO BE PRESENT IN THE WEDDING AND WISH YOU IN THE HAPPYPP MOMENT, CIRCUMSTANCES AND AGE DOESNOT PERMIT SO. my heartiest wishes and congratulations to have a peaceful life with new hands ! Wish a Happy Married & Prosperous Life. All the best our prayers and wishes to both of you. Wish you a very happy married life. Congrats Rajandran, for a Happy and Prosperous Married Life! Her posts are as detailed, absorbing, useful and informative as your posts!! Wish you a very happy married life…. Wishing you and Vidhyaa All the Very Best in life . May God bless the couple.I wish you that quarrel, misunderstanding and misfortune will never ever touch you. Have a long and happy life together! Wish you a happy married life..
May GOD bless you and vidhaya, a happy , prosperous, long,wedded life. Heartly Congratulation for your newer version……. May God bless you with all Good things in the world. Wishes to Vidhya too for her excellent blog. Wishing you a very happy married life.God bless the couple. Wishing both of you All the Very Best in life. Congratulations to both of you .I am a regular visitor of marketcalls and i must confess that i have learn lot from it. wish u a happy married life . Congratulations may you both have a happy and peaceful married life. Wish you both a Happy Married Life. Thanks everyone for your hearty wishes! Congratulations to both of you .I am a regular reader here, for past few years of marketcalls and i must confess that i have learn lot from it. Wishing both of you All the Very Best in life. Congratulations to both of you !! May god bless you both. Very Hearty Congratulations to you and your would-be. Thirumana nal Valzthukal. CONGRATULATIONS! for such a memorable day of your life. Best wishes to both of you and your family members. sir april fool to nahi bana rahe hona ? Congrats , Wishing u both a happy married life .. Wish you a very happy married life…………. WISHING YOU HAPPY MARRIED LIFE …..
Wishing u a very happy married life. I convey my best wishes for this celestial bonding. I will not be able to attend your marriage because of my pre-decided travel plans, but do know that my best wishes are with you. I wish you to be always free spirits since Easter is not just a Resurrection of God, it is a rejection of slavery, a union of faith and conscience! Hearty Congratulations to both of you !!! Wishing U a Very Happy Married Life……….! may you both be blessed with love and happiness forever! Congrats Rajandran! Wish you and yours and Happy Married Life!! 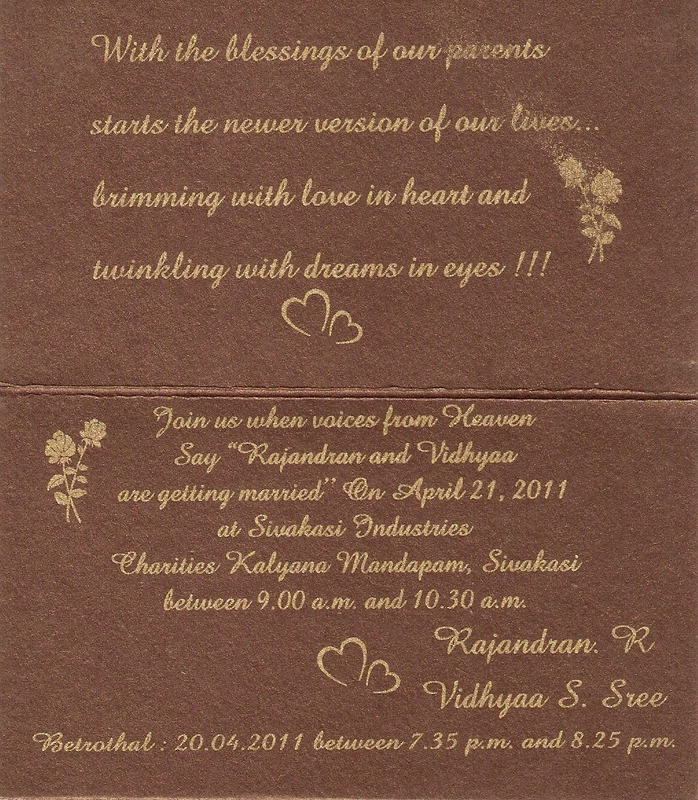 Wishing you Heartiest congratulations for the wedding and best wishes for the second innings of the life… Enjoy !! I never thought you r so young and unmarried!. Congratulations and my best wishes to you both. My place is far away from Shivkashi. Once again my heart felt wishes. Best wishes for a happy married life. My Heartiest Congratulations to you. And Best of Wishes ! Sorry wont be able to attaend the wedding. Hearty Congratulations and Best wishes for happy married & prosperous life. My heartfelt congrats to both of you for a happy married life. Wishing you and vidhyaa a very happy and blissful married life. Wow, great news. I am not regular in the internet for sometime, so read it late. Wish you the very best, pal. And, saw her blog too. What a combination of subject, aesthetics and presentation. You two make a fine pair. May God shower on both of you all His blessings. May you get whatever you may dream of and wish for. wish u happy married life……. My Hearty blessings to you and Vidyaa S. Wish you a happy wedded life. Heartiest congratulations to you and Vidhyaa n All the Very Best in life . wishing u a happy married life. Your New fan and student of technical analysis.